Bille and Bettina. A Love Story in Three Acts. 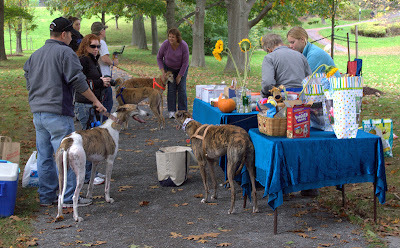 This Sunday we attended Gallivant with the Greyhounds. 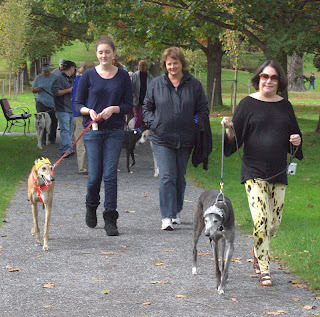 This is an annual fundraiser for the Maine Greyhound Placement Service. 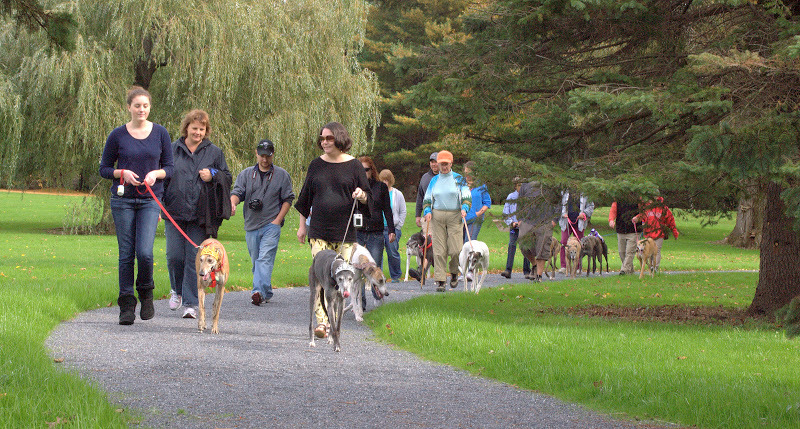 Greyhounds from all over Maine gather in our state capital, Augusta to promenade the hounds around Capital Park. It's a beautiful little park across from the state capital building. The weather and foliage was perfect. This year they raised over $3000 for MGPS. 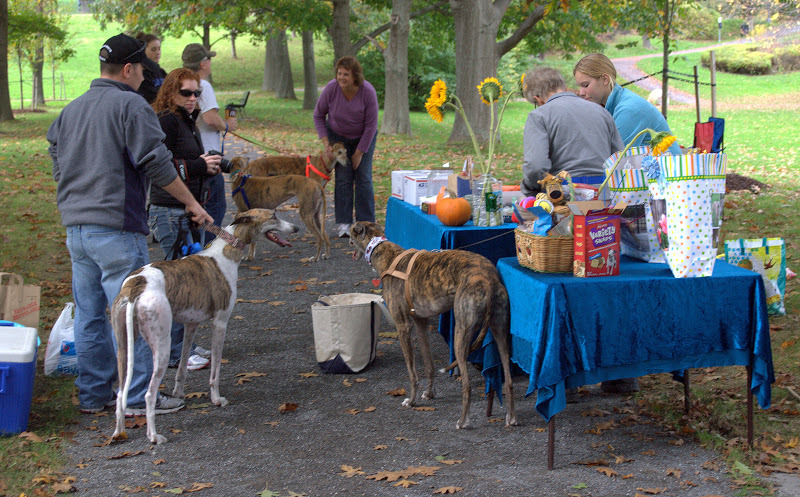 Besides all the important reasons for being there, it's also a fun day where the hounds get to hang out with each other, with adoring greyhound fanatics and the public gets to enjoy something you don't see everyday. The parade is kicked off by the King and Queen (top fundraising hounds) complete with crowns. 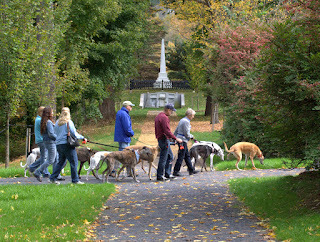 Then about all the hounds fall into place as the entire entourage walks the circumference of the park. If you've never met a greyhound, coming upon 30 or more of them in the park is quite an experience. Bettina and Blue took part since Mumma went to take photographs. Bettina made the full walk of the park but did balk a number of times. I think she was a bit upset that she didn't get a crown but we're chalking it up to the gravel walkway wreaking havoc on her tender paws. Despite Bettina's complaints, it was great fun and a successful event. Thanks to Sharon Eugely for spearheading it again this year! Today is Bettina’s 4th birthday! When Girly Girl sent me across her path in November two years ago, she must have known on how many levels Bettina was going to help me move forward. Bettina’s birthday, coming a few days before the anniversary of GG’s passing, helps take the sting out of this time of year. Well, it doesn’t really take much of the sting out yet but I hope that one day it will and I expect that was GG’s intention as well. Bettina is nothing like Girly Girl. I have never run into another creature quite like Miss Bettina Fussypants. She’s bossy. She’s demanding. She’s a princess. She’s all about her. She has no problem invading Blue’s or my personal space. She expects to be given everything she demands. She believes that all humans were put on this earth to rub her belly. Endlessly. She does not even try to comprehend why I don’t give her something yummy to eat every time she “requests” it. She talks all the time. She has no patience. She’s smart like a fox. She’ll work whatever angle she can to get what she wants. She bullies Blue. She always wants to be first. She always wants to be the one calling the shots. She hates the word no and frequently pretends she doesn’t hear that word at all. She thinks her mumma should quit her job to spend all day amusing her. If mumma wants to go for a walk, she doesn’t want to go. If mumma doesn’t feel like walking, she doesn’t want to turn back. She hates having her picture taken and refuses to cooperate with that process despite the fact she has a mumma whose avocation is photography. She believes the couch is wholly hers. She co-opts mumma’s bed and frequently her pillow. She gets a kick out of making outrageous requests for nail polish, woof clocks, purple coats and collars and cheddar cheese when we visit animal communicators. If Bettina’s awake, then everyone else should be awake. Every toy in the house belongs to her. If it suits her, she will learn a new skill quickly. If it doesn’t suit her she’ll look at you like you have three heads (or stand at the top of the stairs and loudly protest your not agreeing to carry her down). She has a memory like an elephant except when it comes to things I don’t want her to do. She plays rough. She’s more stubborn than any mule ever thought of being. She misbehaves at Grammy’s house. She always tries to rub her muzzle off when we go to play dates. 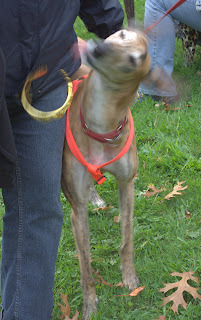 She also tries to rub her collars and coats off. She never listens to me. She throws temper tantrums in the pet store. She shamelessly wheedles treats out of the pet store employees. She randomly pees inside (just for fun, I’m certain of it). She refuses to go outside if it’s raining. She jumps up on people when she’s really excited to see them. She burps in mumma's face. She kicks me randomly while we're on the couch. There is a good reason why the rescue kennel nick-named her Crazy Mo. There have been so many times when I have asked Girly Girl if she sent me Bettina as a comfort or a punishment. It’s been two years since my Beena-weena came to live with us. And she’s gone from a baby of 2 years old to a young adult of 4 years old. 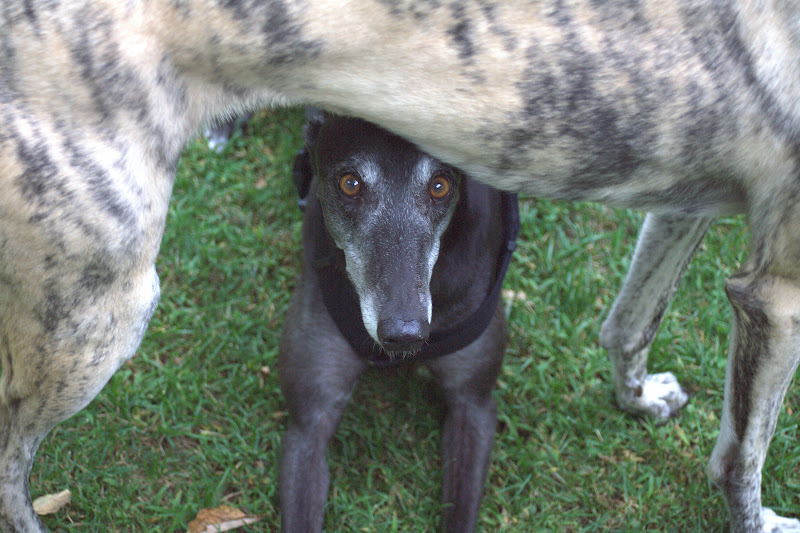 Her face and muzzle have gone from almost totally black to almost totally white. I’m sure if she could, she’d tell you that I made her go prematurely gray. I love this nutty little hound. I suspect Girly Girl knew that would be the case with the side bonus of being able to give mumma a little payback for the times I was less than perfect. Happy 4th Birthday Little Bit! And thank you my sweet Girly Girl (at least until the next time Bettina does something Bettina-like at which point I’ll be asking you Why!?! WHY did you do this to me!??!?!?). 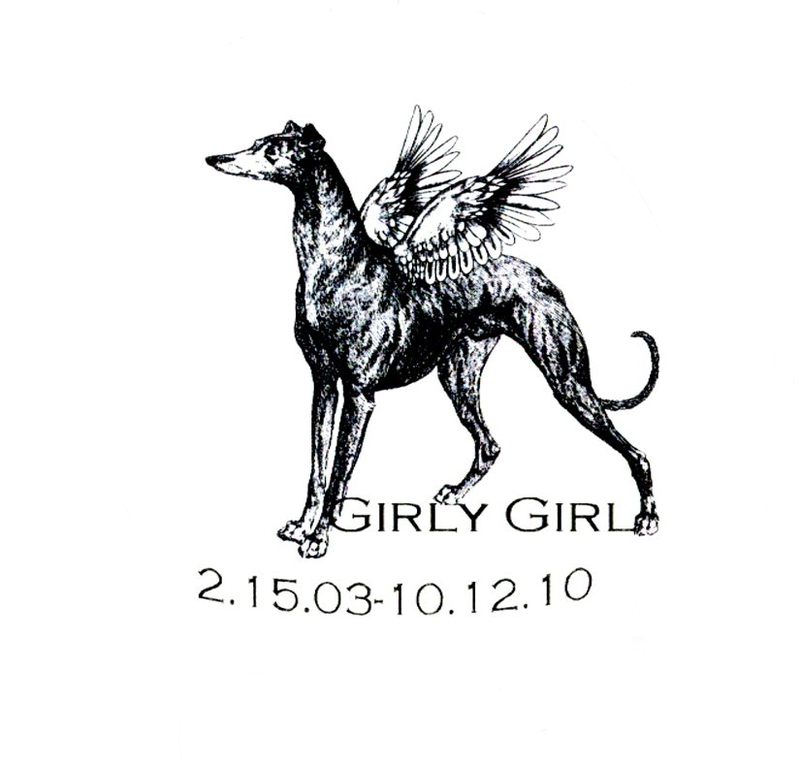 I’ve made no secret of the fact that the loss of my heart dog Girly Girl has been a devastating event in my life. Every day has been tough without her but for 4-5 weeks before her birthday in February and again before the day I lost her in mid-October, my heart always reminds me of just how broken it is. Sometimes I don’t even realize at first why I start crying more. Why I feel so much more sad than normal. Then somewhere in those weeks I figure out what anniversary is coming. The flood gates open for a while. 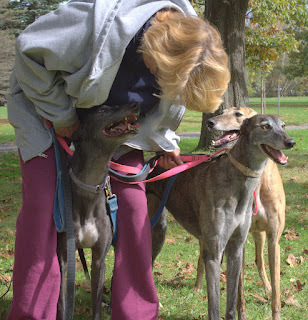 During Girly Girl’s cancer battle, I spent a lot of time on Grey Talk. I distinctly remember one lady telling me that 10 years after the loss of her heart dog, she was still greatly affected by it. I recall thinking that is a long time to actively grieve for any living creature, even a heart dog. But here approaching anniversary number two since her passing, I have no doubt that I’ll be in the same place at year ten. I have learned for myself that there are some things that you just never get over. 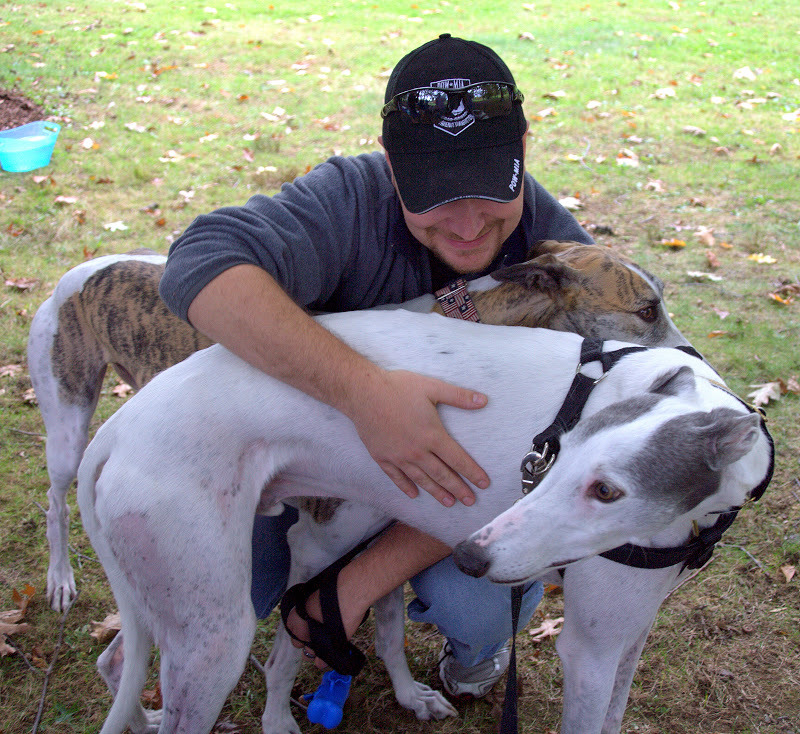 Canines and cancer have not only been on my mind, but they have also been much in the news lately. There have been a couple of interesting study results published that give me hope. The Ohio State University Greyhound Health and Wellness Program in collaboration with Dr. Carlos Alvarez of The Research Institute at Nationwide Children’s Hospital have sent for publication the results of a study they had been conducting on cancer genes in greyhounds. 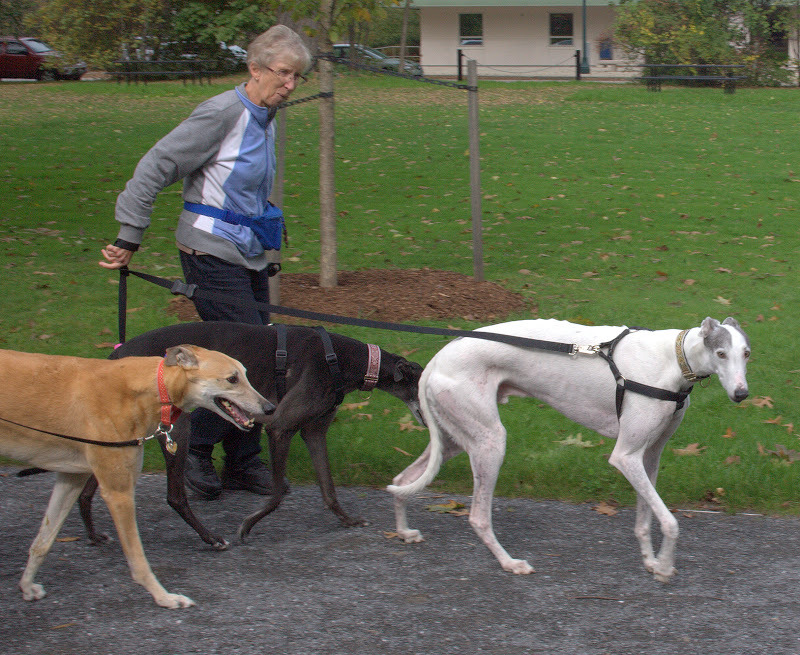 They were able to isolate a particular gene that, when carried by a greyhound, pre-disposes them to osteosarcoma. 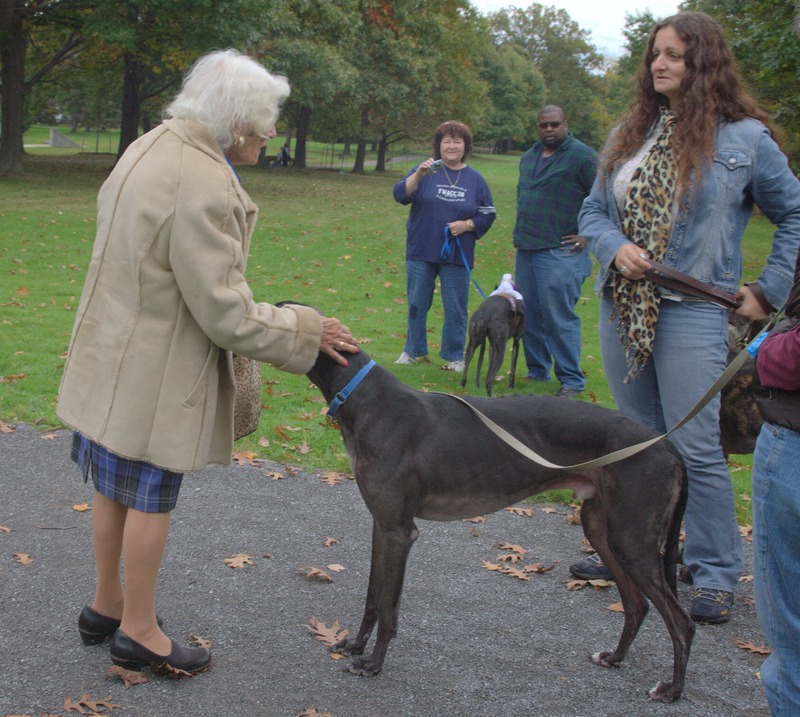 That in itself is not a cure but knowing about the gene, we can now test dogs to see if they carry the gene. We can apply everything we know about prevention and stack the deck in our favor. Breeders can make informed choices based on the presence of this gene. Not too much further down the road, they will develop gene therapy which will target the cancer at its genetic source. Possibly, even further down the road, we will find a way to simply switch that gene off so it will never be expressed. It’s a first step with a long way yet to go, but paraphrasing Lao Tzu, every journey must begin with a single step. 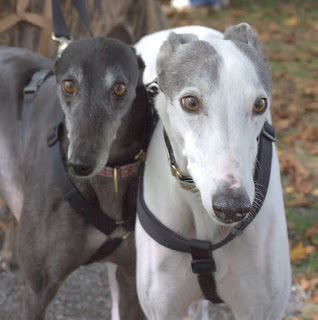 The other study done by two veterinarians from the University Of Pennsylvania School Of Veterinary Medicine took dogs diagnosed with hemangiosarcoma and gave them compounds called PSPs derived from a type of mushroom called Coriolus versicolor. This mushroom is more commonly known as Yunzhi. 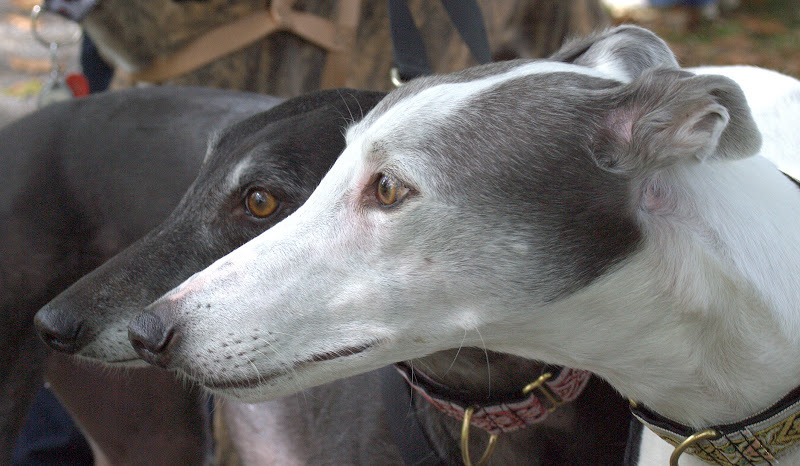 The dogs who received this compound had the longest survival times EVER reported for dogs with hemangiosarcoma. This is a particularly pernicious cancer that affects blood cells and is incredibly hard to treat. 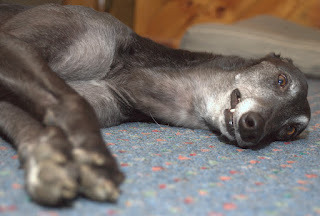 Prognosis for the unfortunates with hemangiosarcoma is dismal even with treatment. The possibility that the time we get to spend with our babies can be extended, potentially significantly, just by adding a mushroom supplement to their daily regimen is incredibly hopeful. This may end up being a step that is inexpensive and within the reach of most of us even when expensive surgeries and chemotherapy are not. I remember the feeling of helplessness in the face of cancer all too well. 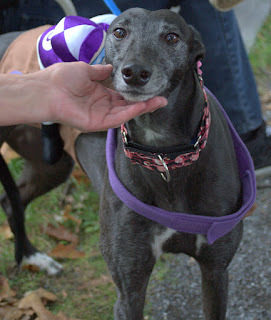 I was lucky at the time to be able to give Girly Girl all the treatment available. 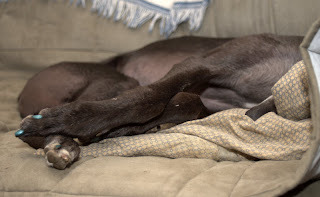 The thought that I don’t have that option any longer should Blue or Bettina get the dreaded diagnosis keeps me up at night. 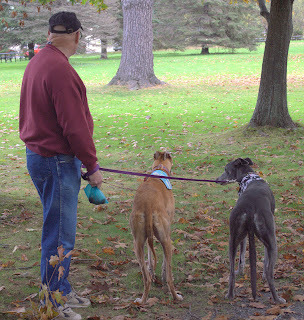 Here is something that we can all easily do which can prolong the quality and length of time we get to spend with our companion animals. Though this mushroom has only been studied on canines with hemangiosarcoma; there is also every possibility that it will have similar effects on other types of cancer as well, including osteosarcoma and lymphoma. Further studies are planned to confirm the results of this study and compare the results from using the mushroom to groups receiving conventional treatment. 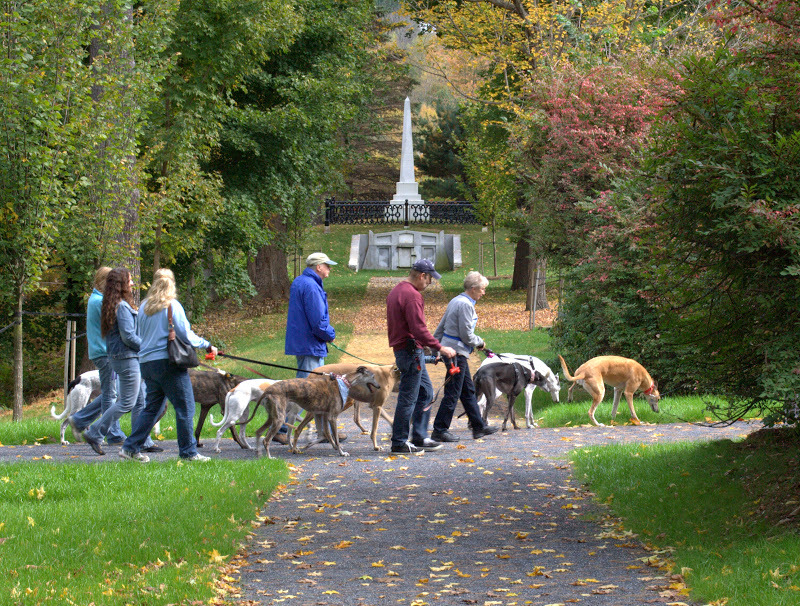 The fraternity of loss due to canine cancer now has these two things to celebrate. The pace of research and discovery is picking up. The Morris Animal Foundation, the AKC Canine Health Foundation and many other groups are funding scientists so that by the time I reach the 10th anniversary of Girly Girl’s loss, we won’t be having this “C” word discussion about any more of our beloved companions and I’ll have to find something else to write about every October.